Plenty of us hate driving at night - we're tired, we want to get home, it's dark, and, frankly, we just want to get home. However, statistics from the National Highway Traffic Safety Administration show that while only 25% of driving is done at night, more than 50% of all driving fatalities occur then. Fortunately, as always, knowledge is power: understand the precautions you can take to heighten your driving safety... at all hours. Turn on your headlights. Make sure they are properly aligned (not uneven or pointed lower than necessary); if they are not, they will diminish road coverage and blind oncoming traffic. Clean road grime from your headlights often, especially if they are old, yellowed, and faded. You can buy a headlights polish kit to remove the haze. Only use your high-beam lights when you are traveling in rural areas. Make sure they are off if you approach traffic or a hill, since they can blind other drivers. Dim your instrument panel and dashboard lights. If they are too bright, you may compromise your forward vision. Flip your rearview mirror. Some mirrors have night settings that can be turned on by flipping a small lever at the bottom. Lights in the glass will appear dimmer and thus less bothersome. Maintain a greater distance between you and the car in front of you. Distances are more difficult to gauge at night. Avoid looking directly at oncoming headlights. Bright lights will disrupt your concentration at night. Instead, look down at to the right, gazing at the white line on the side of the road or where the pavement meets the shoulder. Use that to track your lane instead of the left side; you can still see other vehicles with your peripheral vision, but wont' be bothered by the glare. Look for retinas. You can often see light reflecting off an animal's eyes long before you see the animal itself. When it comes to large animals such as deer, slow down as quickly as you can. If you try to steer around them, they may follow your lights and move in front of you. 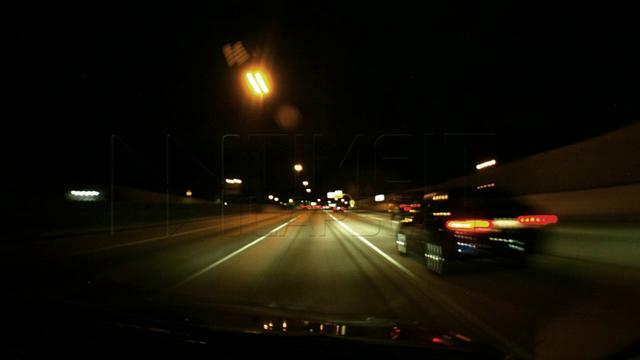 Take frequent breaks if you are driving at night for a long period of time. It will reduce fatigue and give your eyes recovery time. Schedule periodic vision checks. ALmost 90% of driver reactions depend on vision. Be sure to wear prescription glasses (especially if they have anti-reflective coating) or contacts as needed.